After what seemed like a very long winter and even longer blogging hiatus, I’m so excited that the One Room Challenge is back again! The One Room Challenge is a bi-annual event each spring and fall created and hosted by Linda Weinstein where designers, stylists and bloggers transform a space in just 5 weeks, sharing their trials, tribulations and creative process along the way. I am always so inspired by the ideas, support and camaraderie that this event draws each year. Powered by media partner Better Homes & Gardens, The One Room Challenge gets bigger and better every year - so big that there are already 200 guest participants entries as I write this post! My very first experience in the One Room Challenge was during the Spring of 2017 with my daughter Lily’s room. After that I was hooked and I’ve joined as a guest participant ever since, completing my Bedroom/Office (Fall 2017), our Stairway Library (Spring 2018) and a double take last time with my Niece Audrey and Nephew Clark’s rooms (Fall 2018). After seeing me transform all of the bedrooms around him for the challenges my son Matthew (9) must have been feeling a little left out despite a quick refresh to his room a couple of years ago. Throughout the winter we scaled back on the art on his walls and moved his bed around 3 times but he was still craving a change. He really wanted light and bright and a complete colour transformation - a full 180 from the dark and moody room he had asked for when he was 3. But … change is good and change is what he has asked for! 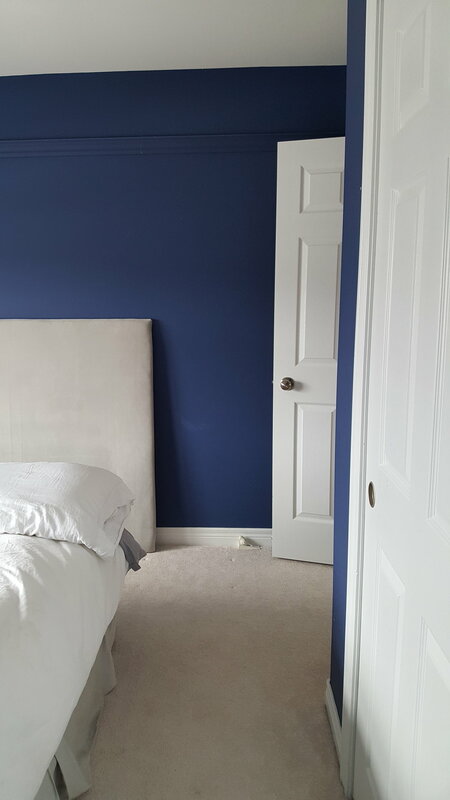 We’ve cleared nearly everything out including the DIY headboard and I’ll be patching and priming over the next couple of days, this time in partnership with Orillia’s Sherwin-Williams team! Once that’s done my brother Paul from Brancon will swoop in with his amazing fine carpentry skills, installing the crown and reworking an antique burled walnut bed. We have so much work to do but I’m really excited to push some design limits on this one and will even be using wallpaper for the first time in our home. I hope that you will follow along with me here and on Instagram throughout the challenge as well as the other participants - both featured and guests.